Ever thought about having artwork for a ring? Now you can with the Apples of Gold art deco garnet gemstone ring. This solitaire piece matches a rich, red garnet stone with the best in art deco details to make a winning combination. The garnet gemstone is round cut for lovely shine and measures 6mm. The band is wrought of radiant silver and features expertly carved leaf and vine details for added style. Two coils of silver and four prongs keep the garnet and the band beautifully bound. 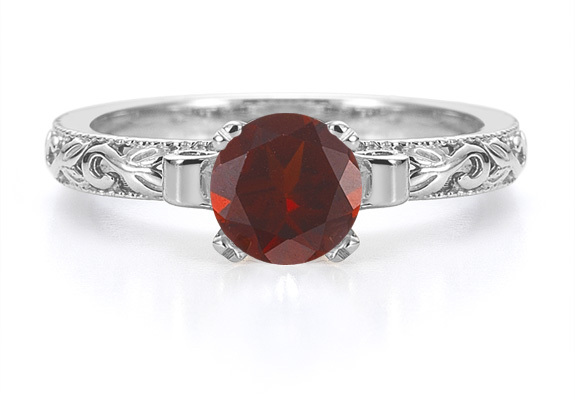 We guarantee our Garnet 1 Carat Art Deco Ring in Sterling Silver to be high quality, authentic jewelry, as described above.